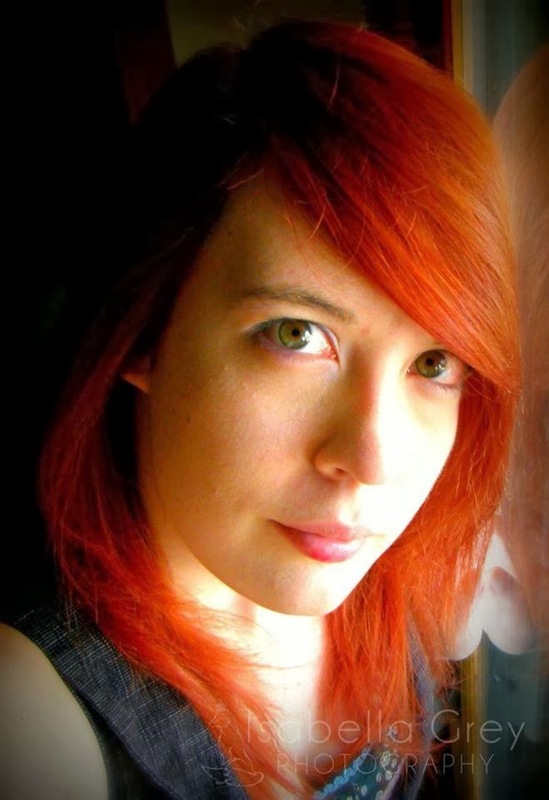 Just Another Static Heart: Are you Ready for a Disaster? 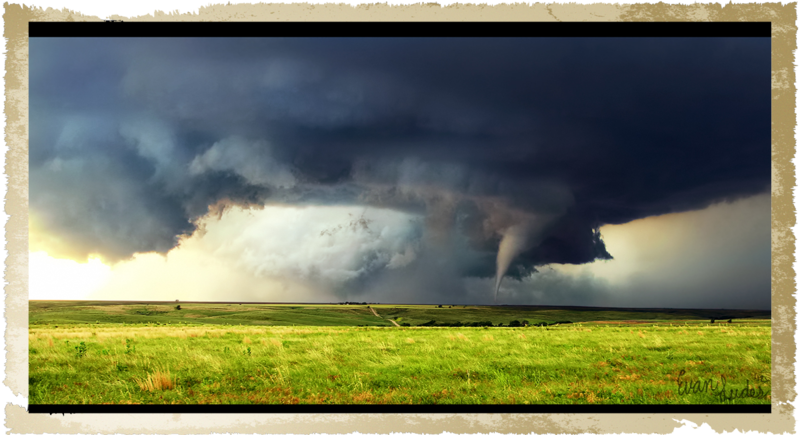 It may only be early January, but here in Kansas, that means Tornado season is coming on quick! Last year we had our first tornado of the season in February, and I was unprepared when the sirens went off. This year, I'm making sure I have everything I need BEFORE the sirens go off. But, the question is, are YOU ready for an unexpected tornado if it comes knocking? Around here, severe storms hit more often at night. Which means that spotting a tornado on the ground is much harder, and that the time between the sirens going off and a tornado hitting your city can be slim to none. In February, we had no watches or warnings, just the sudden blaring of the sirens. It was 9 o'clock at night, and the rain was pounding so hard that it soaked through my thick Carhartt coat in about 30 seconds. The wind was blowing so hard I was knocked off balance four times in the 100 feet it took to run to the storm shelter. Every minute we took to gather supplies and pets, could have cost us our lives. So what's the best option for you in a situation where every second counts? 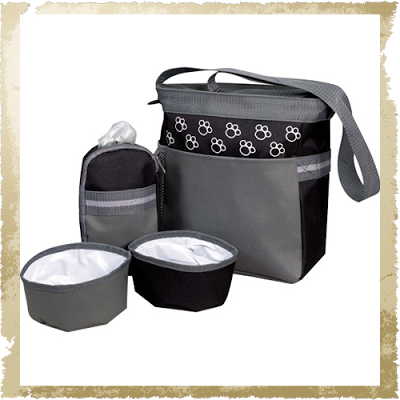 A well supplied Tornado Emergency Bag, that you can grab and go! If you don't have a basement, this is what I suggest using. It takes up very little room in a closet with you, and is easy to keep stocked at all times, as well as grab in a high stress situation. A well stocked bag is key! I use a large messenger bag I had laying around, and keep it packed at all times, except when I'm rotating out supplies. Here's a list of the things I keep in my kit. I received an emergency flashlight radio for Christmas, and it too has gone into my kit! You can find a great list of them HERE. A whistle is necessary in any kit, as it helps people find you if your shelter is buried under rubble. Small LED flashlights can often be found for just over a dollar in most checkout lines at the grocery store, and are brighter than normal flashlights. I keep an average of three in my kit, as well as one in my camera bag. On that note, I keep anything I would be heartbroken to lose in an easy to reach place. For instance, all my jewelry is in a small chest on my computer desk, and all my critical paperwork is kept in a folder on my desk as well. Since the desk is right next to the door, it is easy to grab them quickly, stuff them in the bag, and go! I also keep my camera packed in its bag at all times, unless I'm using it. That bag, as well as the case to my laptop, sit on the floor next to the same desk. It takes me 30 seconds to pack my laptop now, so that is more time saved in a hurry! All the important cords to any electronics I take are also in my camera bag or laptop case, so I don't have to worry about that. But what about when you don't have to worry about just yourself? We have two rabbits in the house, and unlike dogs or cats, they are NOT easy to just grab and run with. They have special needs that other pets don't, and attitudes to match! As much as they can be a pain, I love my bunnies more than life itself, so there is no question that I take them into consideration when making my Tornado plans. Pets have to have many of the same things we do in an emergency situation, but they also have to have access to things some people might not ever think about! Here's a good list for any pet owner to use. If a tornado comes through and destroys everything, pet supplies will be some of the last things brought by aid agencies. First and foremost, you need a crate or carrier to keep the animal contained. Each of my bunnies has a pet carrier for transport, big enough that they fit, but small enough that they won't hurt themselves if they become stressed. 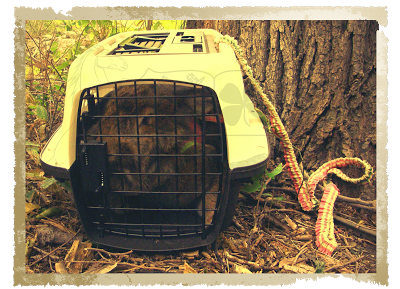 If you have to carry your pet, I suggest putting a covered crate in your basement or shelter, so that the pet also has a safe place to be during the storm. 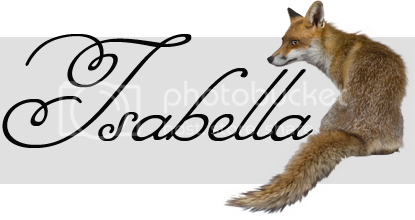 If you live out in the country, like I do, there are no pet shops around to just drive to...so you have to be sure to have enough food and water to last each pet a week. Thankfully, my bunnies don't eat too many pellets, but I have to pack hay and litter, something others might not have to worry about. Each pet should also have a clean container for food and water. 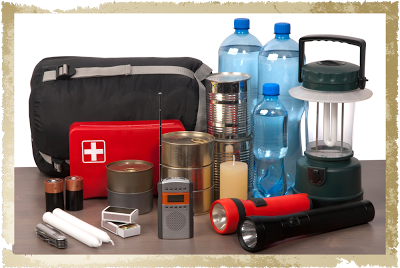 I suggest putting all your supplies in a bag like the one below, which comes with collapsible food and water bowls, and a canteen for water. Blankets and toys are also a must! Animals can become very easily stressed and scared, which can sometimes lead them to be aggressive. The toys and blankets help calm the animals, as well as keep them dry and warm. I hope this guide has helped you start to prepare for a possible tornado, and remind you that disaster can happen at any time...so you've got to be ready! Great post....so often we forget to be prepared. Your post reminded me to check on mine kit. I make the kit then forget about it! Thanks for reminding me to check on it and make sure everything is still inside! Sharing! Great post. I'm so glad we just have to go to the basement and not try to get all the kids and animals into the cellar. We have tornadoes a lot where I live in North Carolina though I doubt it's anywhere near what you have in Kansas. But I am so thankful for our basement where we have supplies just in case we need them. I just hope that we never do and that if we do, we can get our pets there in time. Great tips! 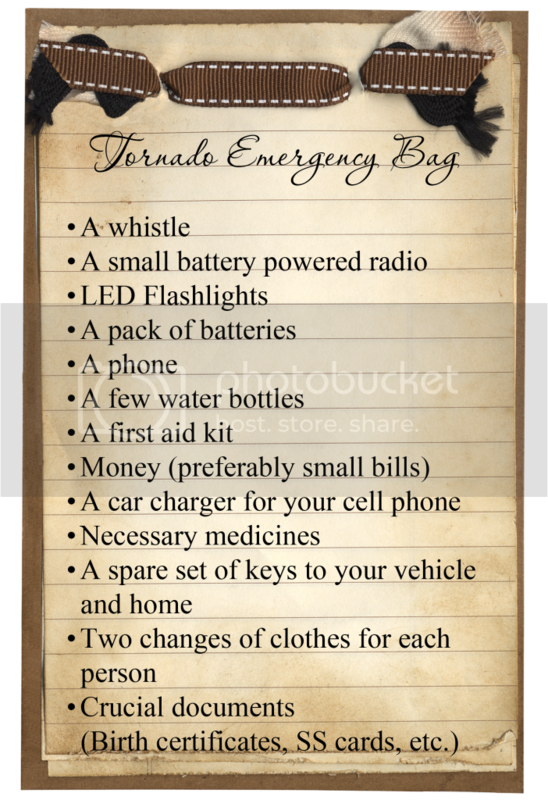 We do not have a bag and after being in my first tornado a few years back I can say it really is needed. It happened just like you said- middle of the night- no warning nothing. It was down and back up before the sirens even went off! the only reason we knew what was going on was the hubby recongnizing the sound and trying to get us to the basement. Luckily no damage to our house, but others were not as lucky. Now we live in a house with no basement and I am doing everything I can to change that! My saying is Nebraska + No Basement = No Bueno! We're in the process of developing an emergency kit and definite plan! I never thought about the whistle or what we would do with our dog. thanks for the reminder to be ready before an emergency comes! Great Post! We have a lot of tornadoes here in TN. You can never be too prepared. This is a great piece! I must admit we do not normally get tornadoes here, but even in any event I am unprepared. I really do need an easy to grab emergency bag for our family! I really need to do this! We live in tornado alley! Awesome post! This is a great reminder that we all need to be prepared. I'm going to have things ready. and we also have 5 pets, so we need their stuff too. Thanks! 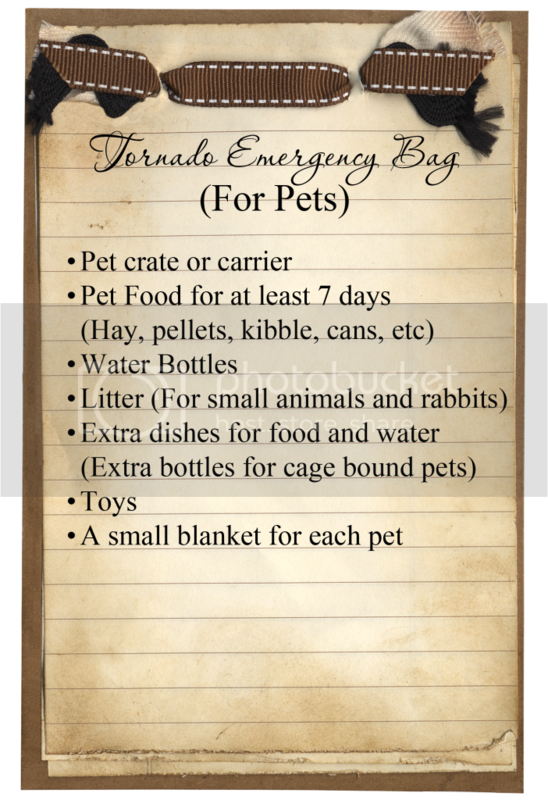 I am so glad I live somewhere that doesn't have to worry about tornado's, but there are so many things that could happen and you never want to forget about your beloved pets. We see lots of tornados here in Texas too! I really feel I need to be better prepared, especially living in a mobile home. Last time we had one coming our way we were fortuonate enough to have it happen when my son was in school, so they let our whole family go up there. Great post with very good tips. I know we hardly ever have disasters like this, but it would be a good idea to be prepared. Thanks for the tips! Very well written and good advice. !